Angiosperm life cycle comprises of two generations, the Sporophytic and the Gametophytic. These two generations alternate with each other in regular sequence. This phenomenon is known as Alternation of Generation. The angiospermic plant, that is usually differentiated into roots, stems, leaves and flowers, is the Sporophyte as it consists of diploid cells (2n). 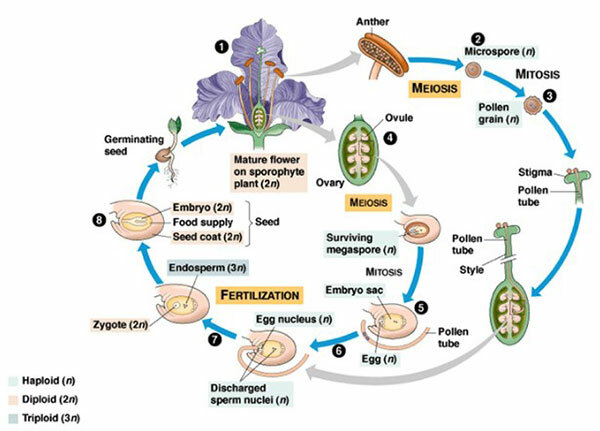 It is the dominant phase of the angiosperm life cycle. As a result of reduction division, it produces haploid Microspores and Megaspores. 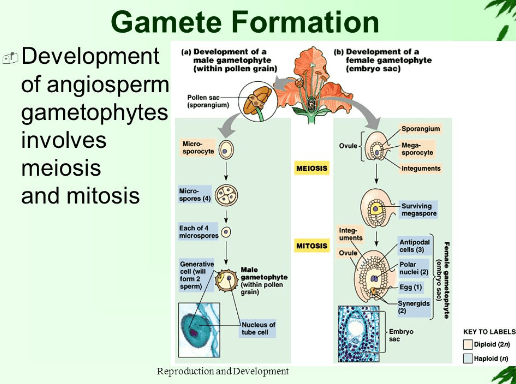 The Gametophytic phase (n) is represented by two structures, the Male Gametophyte and the Female Gametophyte. The male gametophyte is represented by the microspores (pollen grains) and the pollen tube with two sperm nuclei and a tube nucleus. The female gametophyte is generally, represented by eight-nucleate embryo sac. Both gametophytes are highly reduced and completely dependent on the sporophyte. The reduction division occurs at the time of formation of microspores and megaspores and the diploid number is restored when zygote is formed. The zygote, therefore is the first cell of the sporophyte. Another significant point is the formation of Endosperm. Endosperm in angiosperms is usually triploid as it develops from Primary Endosperm Nucleus formed as a result of the union of two polar nuclei and one sperm nucleus. It is thus formed after the process of fertilization. During the course of evolution there has been gradual reduction and loss of independence in gametophytic generation whereas sporophytic generation has registered a gradual increase in size to attain even tree like proportions in angiosperms. The oospore (thick-walled zygote) produces Embryo by segmentation; the ovule produces Seed and the ovary the Fruit. The seed and fruit protect the embryo and also store food for it. The seed germinates into a Seedling and then slowly develops into a mature plant. The flower is a modified shoot and appears as a small bud first and develops much like a foliage bud. However, it differs from foliage bud in that there is no elongation of the internodes, therefore the floral leaves are grouped together and not distributed at intervals as leaves on stem branches. The primordium of flower appears as a small axis of meristematic cells which enlarge into a rounded structure, the Receptacle and a narrow stalk which becomes Pedicel later on. The floral parts arise at the tip of the receptacle as rounded protuberances of meristematic tissue. At four points, the circles of four sepals appear first on the receptacle (Shepherd’s purse). These are followed by primordia of stamens. The pistil arises as a continuous wall about the apex of the floral axis. The formation of pistil primordium stops growth in length of the floral axis. The petals appear in the last. 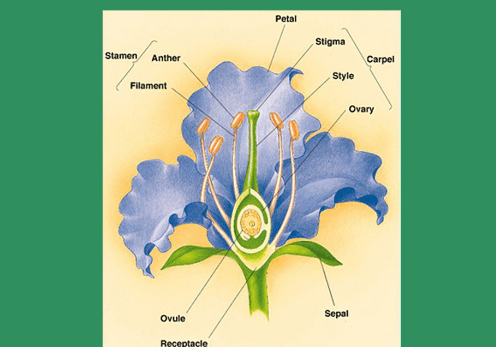 Each stamen consists of three parts i.e., Filament, Anther and Connective. The filament is the stalk of the stamen and at its tip two anthers connected with a sort of mid-rib called Connective are present. Each lobe of the anther contains two Microsporangia or Pollen Sac, thus there are four chambers in each anther. Each pollen-sac contains mass of cells the Pollen Grains of Microspores. A cross section of young anther shows that each anther lobe contains two pollen sacs. As the anther matures, the tissue between each pair of pollen sacs and the two pollen sacs disintegrate and two large cavities are produced instead of four in each anther. Within each microsporangium a number of Microspore Mother Cells are produced which are surrounded by a layer of nutritive cells, the Tapetum. Outside the tapetum many-layered wall of the sporangium is present. The outermost layer beneath the Epidermis shows Characteristic band-like fibrous thickenings. This layer is Endothecium which helps in dehiscence of anther. Opposite the partition between each pair of pollen sacs, the cells of the endothecium are thin walled and form the Stomium, which makes opening of ripe anther. Each microspore mother cell undergoes meiosis to produce four microspores.